Could you please? Do you want help? I've done this before, I can do it. How about I do this one, can I do this one? I love touching microphones. It makes me feel in control. What's this for? Violin, oh yeah. Meredith is gonna keep placing the microphones, we're gonna discuss overheads. 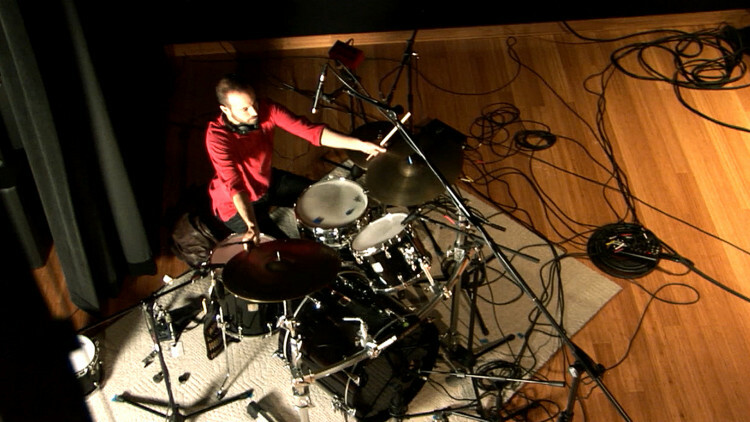 A lot of, depending on the music you do, overheads may be all you need for the drum sound. I know it sounds incredible but a good pair of overheads is really what you need. In this particular case, because of the very kind of like, textural quality of the part, I like that 'booom'. And that I'm not gonna get from the overheads, I'm gonna get from those microphones. But check it out once Mary places the overheads. One second Timur. I know you wanna play. Tsss, drummers! Can't do with, can't do without. Because Meredith has probably done 300 drum sessions over the last two years, She has a fairly good idea of where it might work. But she's never worked in this room. So maybe the reflections are different, maybe it's not gonna work out. The overheads are designed basically to capture the whole instrument. The drumset, contrary to popular belief is really one instrument. If you can make it feel that way, for this kind of music is cool. If you're doing a Lady Gaga record, send me a postcard. Now we're gonna record a few bars of that. Maybe you wanna do the end of the verse into the breakdown so we can hear the cymbals. Let's listen to that without the direct sound. The overheads being the two microphones way up there. Right? It's a lot of snare, a lot of hi-hat. So we're gonna learn from that and move the overhead. - What you're gonna do? - I'm gonna move it slightly back. So we get more cymbals less drum. And then sometimes maybe even angle them. Those new Mojaves are great and they're very smooth as you heard. What we're doing is taking advantage of their patterns to aim at what we wanna hear more. You know? Fixing in the mix doesn't exist. You can kind of hide the misery in the mix. How's that? Might as well spend and extra five minutes here. It doesn't hurt. See the hi-hat is no longer in your face? It's amazing right? We've moved it this much. So now we're gonna check, Remember how the phase between the two bass drum microphones changed everything? Well how about the phase between the bass drum microphone the overheads, the snare, the hi-hat, the top microphone? Yes, you do have to pay attention to that stuff. How do you feel about that? Usually what I'll do is I'll solo the kick, listen to that and I'll just pop on the overheads. So we're listening to the bottom of the kick. She listens to the kick, and she makes sure the bottom is there. Then she turns the overhead on. What happens? Hear with the overheads in. Nothing happens because she's good. What might happen, what happens a lot is you have an awesome bass drum sound you turn on the overhead and bass drum goes. Because the overhead is out of phase with the bass drum. And consequently all the bottom goes away. What's the solution to that problem? Move the microphone. Or flip the phase, but if you flip the phase then what happens with the snare? And what happens with the tom? Moving the microphone is the least amount of pain for the most amount of return. What we're gonna today is place microphones. Use good quality microphones, good quality preamps, good quality converters, And we're gonna make a record with it. Which I'll be mixing tomorrow. But at the end of this one hour and half we'll play just a whole track, you tell me what you think. There will be very little compression and EQ, if any. Maybe on that 'shhh' thing. I'm not super enthused by this. Play that again so we can put it in our ears. I don't know how it feels right there. I just doesn't feel like his hi-hat. Can you stop? Can you play that 'shhh' on your hi-hat? See, his instrument doesn't goo 'eeeeeee'. OK. So in this case what do we do? This is our assumption. It's an MA 100 on the hi-hat. And that's probably not the best choice, in this particular case, with this drummer, with this kind of particular weather and what we have for breakfast this morning. What we have for breakfast this morning is a disgrace. Specially for a french boy. So we're gonna switch, since we don't have any more microphones why don't we just switch the high tom mike for the hi-hat mike and see if it makes a difference. You set everything up, you like it, don't let your laziness take over. If the microphone is not quite there, switch it. You may or may not have noticed, Timur is not specially in love with this high tom, on this particular part. I don't think he's hit it once so far. So my hunch is that the high tom microphone is not super crucial. So why don't we just use that on the hi-hat and see if it sounds better. It's always better to switch a mike than just to say 'ahhh'. "I'll hide the misery in the mix". The signal flow today is as such. We have microphones from Mojave and Royer. Mojaves tend to be the condensers and Royer is all the ribbons. Going through preamps from Universal Audio and Great River which is this rack here in the middle. Which we'll describe in a minute. Going through Avid Pro Tools using the new HD IO converters. Right here. And a Pro Tools 9 rig. So if you're wondering if you can track a band with HD native I confirm that you can. It's great, very powerful system. Going through monitoring and summing from Dangerous Music. You'll see the summing tomorrow because today we're tracking the song but tomorrow I'm mixing it. Monitoring and summing from Dangerous and then, lastly speakers from Focal. And those are the sponsors of the event today. This is the chain we have, you can go wrong with this guys. What we just did right now is we switched the hi-hat and the tom microphone to see if we can get a better tone on the hi-hat. Let's do that part where you go 'shhhhh'. Cool, let's listen to that. See, all the edge is gone. Now, does that mean that MA 100 is a bad microphone? No. It means that the MA 100 was the wrong microphone for the job. We switched it with the 101 now we have the right microphone on the right stuff. You don't have to have that 'eee' thing. We can move on to the rest of the miking. that's something you do very well, I'd like you to explain why is the hat microphone placed like this? It looks odd. the snare mike is positioned slightly so that the rejection is, you know, it's rejecting the hi-hat. Meaning, the back of the cardioid pattern, you've seen it, the one that looks like a heart that's been blown up right? The back of it is rejection, you don't hear as much from the back of it. And she points it so that the hi-hat is not as loud in the snare microphone. And then? Yeah, usually it will be looking something like that. And then with the hi-hat, that's and interesting way. Same thing with the hi-hat just obviously not as drastic but just slightly angled so that it's rejecting the snare. So if you have your hi-hat like this she places the mike like that, with the snare being here. Meaning, she uses the back of the pattern to reject as much snare as possible. There isn't such thing in the world, but if you have a drummer who bashes on the hi-hats louder than the snare, you know that drummer, this is a good trick. There's only one, you know him, we all know him. It's a good trick make sure that you can make a record with the recording. If you solo the hi-hat and play what we just did. Listen to the snare bleed in the hi-hat. That's a condenser that is this far away from the snare but we still get really good rejection. How about the snare mike to hear how much hat we have in that. And I just angled it more. And we're not talking hypercardioids or any complicated thing, we're just talking about common sense using what the microphone does to your best advantage. Let's move to the drum preamps. How you choose your preamps? Do you have to have a late 60s 1073 with and LA-2A and this and that to be able to make a record? Ahhh, no! You don't. So Meredith, how do you choose your preamps. I said OK, this is what we're doing today. These are you available preamps. How do you choose?